This weekend was the Fourth Avenue Street Fair in Tucson. 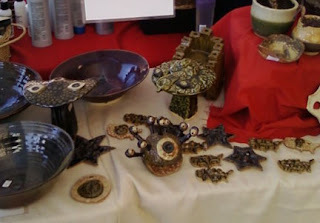 My offerings included some mushrooms, Grell Shroom 1, Beholder 6 (The Bad-Dental-Hygiene Beholder), several skull stars and USA-shaped surrealist objects. Today, a roving mob of married, middle-aged D&D geeks recognized this as a Beholder and bought it.